Hosting a Hollywood theme party? PartyCheap has the decorations to make your party feel like a glamorous red carpet event! Decorate your party space or home as well as the entrance to the party to resemble a Hollywood movie premiere. Use our Red Rope Stanchion Set to guide guests to the appropriate entrance for your party and give each quest a VIP All Access Backstage Party Pass to get into the event! The VIP Backdrop would make a great background for quests to model their designer suits and gowns and pose for red carpet photos! Bring the feel of old Hollywood glamour by draping our Black and Gold Fabric Bunting over doorways, railings, or walls! Invite the paparazzi to take photos of your famous quests by putting up our Paparazzi props! Drape the Glittered Hollywood Streamer over your wall to remind your guests of the famous Hollywood letters on the hill. Thank your guests for coming by giving them the VIP Goody Bags filled with whatever party favors you choose to distribute at your event! If you will be honoring any achievements at your party, you can't go wrong by giving the Awards Night Male Statue or the Awards Night Female Statue to the people you wish to recognize. 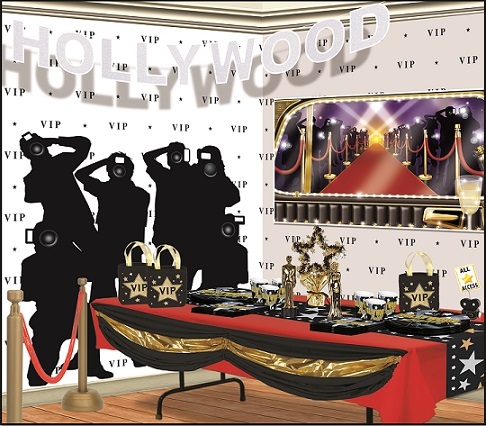 The Hollywood VIP Party Scene Decorations are great to use for a Hollywood themed birthday party, an awards night event, or even a prom theme! Decorate your party in full Hollywood glitz and glamour and make your guests feel like the stars that they are! Browse our full Hollywood party collection for even more ideas!